Suitable for use with our sign frames, this First Aid/Nearest First Aid Box Sign A5 Wipe Clean is an effective means of identifying the location of medical supplies. 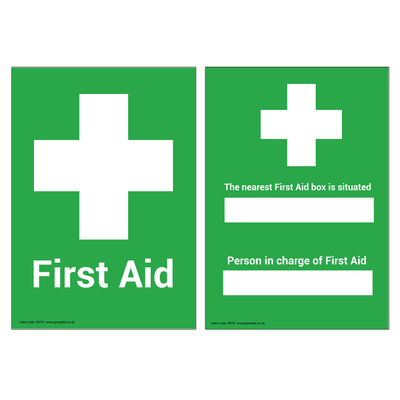 Made from a 350gsm paper with laminated finish for added protection, this compact box sign can be placed in the most appropriate locations around the work place to direct people to the nearest first aid box in the event of an emergency. The bright green and white colour combination links subconsciously with a clinical message while the low cost design ensures you stay well within budget at all times. This eye-catching sign is easily mounted within both our Black Holder A5. We also have a wide range of bold signage including our Gompels Cross Contamination/Colour Coding Signs and the Gompels Hand Sanitiser/Hand Washing Sign A5.